RUDN mathematicians analyzed the properties of gravitational waves in a generalized affine-metrical space (an algebraic construction operating on the notions of a vector and a point) similarly to the properties of electromagnetic waves in Minkowski space-time. They report the possibility of transmitting information with the help of nonmetricity waves and transferring it spatially without distortions. The discovery could lead to a new means of data transfer in space, e.g., between space stations. Their results are published in Classical and Quantum Gravity. Gravitational waves are waves of curvature in space-time, which, according to General Relativity, are completely determined by space-time itself. Currently, there are reasons to consider space-time as a more complex structure with additional geometrical characteristics such as torsion and nonmetricity. In this case, geometrically speaking, space-time turns from a Riemannian space envisaged by the General Relativity (GR) into a generalized affine—metrical space. Respective gravitational field equations that generalize Einstein's equations show that torsion and nonmetricity can also spread in the form of waves—in particular, plane waves at a great distance from wave sources. In order to describe gravitational waves, RUDN researchers used mathematical abstraction—an affine space, i.e., a usual vector space but without an origin of coordinates. They proved that in such a mathematical representation of gravitational waves, there are functions that remain invariable in the process of wave distribution. It is possible to set an arbitrary function to encode any information in approximately same way that electromagnetic waves transfer a radio signal. If scientists can develop a method to incorporate these constructions in a wave source, they could reach any point in space without change. Thus, gravitational waves could be used for data transfer. The study consisted of three stages. First, RUDN mathematicians calculated the Lie derivative—a function that binds the properties of bodies in two different spaces: an affine space and a Minkowski space. It allowed them to pass from the description of waves in real space to their mathematical interpretation. At the second stage, the researchers determined five arbitrary functions of time, i.e., the constructions that do not change in process of distribution of a wave. With their help, the characteristics of a wave can be set in a source, thus encoding any information. In another point in space, this information can be decoded, providing the possibility of information transfer. In the third stage, the researchers proved the theorem of the structure of plane nonmetricity in gravitational waves. It turned out that from four dimensions of a wave (three spatial ones and one time dimension), three can be used to encode an informational signal using only one function, and in the fourth dimension with use of two functions. "We found that nonmetricity waves are able to transmit data similarly to the recently discovered curvature waves, because their description contains arbitrary functions of delayed time that can be encoded in the source of such waves (in a perfect analogy to electromagnetic waves)," says Nina V. Markova, a co-author of the work, candidate of physical and mathematical sciences, assistant professor of C.M. Nikolsky Mathematical Institute, and a staff member of RUDN. Gravitational waves: Why the fuss? I want to know the advantages of transferring data via gravitational waves when compared with data transfer via electromagnetic waves. They both travel with the speed of light if I am not wrong. Is the amount that can be transferred would be greater? Yes I wondered about that but as layman I don't have the 'necessary' to compose a reason answer. However, I did think that as the path EM waves were curved in the presence of gravity from a massive object (or the curvature of S-T) whereas gravitational waves might less affected. Having said that, as second thought perhaps GW's would also follow a similar curvature in the geometry (GR). Is this where the nonmetricity comes in? Any ideas? Most of the used simple codings (amplitude, frequency, phase, pulsed) would transfer directly of course. Very little. it is a purely theoretical exercise and you would need to know how to move and collide supermassive stars to make even amplitude modulated chirps for signals. However there is a future theoretical advantage as the communication would pass more easily through things in between transceivers, except black holes. Honestly I don't see why a civilization would make the effort to try to use it. The discovery could lead to a new means of data transfer in space, e.g., between space stations. Err, NO, it couldn't because there is no practical means of us to generate gravity waves powerful enough to be detected (we don't have access to massive black holes and ability to collide them etc) and it would always be far more practical to just use the old fashioned boring radio waves. @Humy I agree with you. I keep re-reading the article to see if I've misunderstood something. 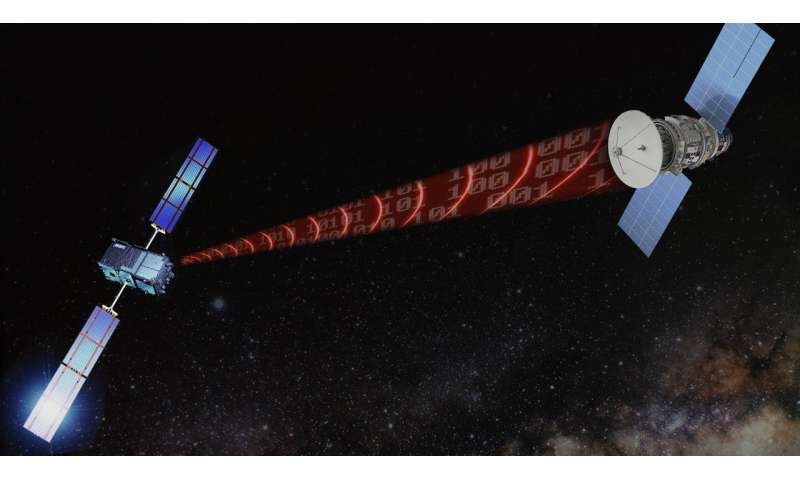 The statement "The discovery could lead to a new means of data transfer in space. e.g. between space stations" is patently absurd. Where is my gravity phone? We apologize to all gravity phone customers for all the gravity phones being currently out of service due to the current gravity wave interference storm. I don't think you guys realize the gravity of the situation...I bought 2 gravity phones for the price of 1 but I found they were only images of the one in the shop. Must have been that d**ned passing BH.